"Compliance with EPA Regulations AT New Bulk Fueling Facility for Addison Airport - Addison, Texas"
The Addison Airport (ADS) is located in a closed-in suburb of Dallas, Texas and logged 133,000 operations in 2005. With a 7,200-foot runway, Addison is the preferred choice among owners of private aircraft and corporate jet fleets because of its convenient access to downtown Dallas, the Telecom Corridor, and other large employment centers. Emphasizing a business-friendly atmosphere and recognizing the needs of the aviation community, Addison Airport has set industry standards for safety, economy, and convenience. Initially developed by a group of flying enthusiasts in 1957, Addison Airport has been owned by the Town of Addison since 1976 and is the second busiest general aviation airport in Texas. The Airport's de-icing and fueling facilities are specifically identified as industrial activities subject to comply with the U.S. Environmental Protection Agency (EPA) Regulations. The 1972 Amendments to the Clean Water Act prohibit discharge of any pollutants into waters of the United States from a point source unless the discharge is authorized by a National Pollutant Discharge Elimination System (NPDES) permit. The NPDES permitting program has been established to monitor the discharge of pollutants from point source stormwater runoff and requires the use of necessary controls to minimize the discharge of pollutants. EPA requires facilities that engage in regulated industrial activities to obtain NPDES permits. The term "Storm Water Discharges Associated with Industrial Activity" is defined in the Code of Federal Regulations 40 CFR 122.26, and determines which industrial facilities are potentially subject to Phase I of the NPDES stormwater program. The program typically identifies these industrial activities through the use of SIC (Standard Industrial Classification) codes. Also, due to the large fuel storage capacity necessary to maintain transportation activities at the airport, the new bulk fuel facility at Addison Airport was required to meet EPA's Spill Prevention Control and Countermeasure (SPCC) requirements. The SPCC rules require facilities that meet the aboveground oil storage capacity threshold of 1,320 gallons or more to prepare an SPCC plan. The SPCC plan is typically designed by an engineer and describes actions the facility must take to prevent oil spills from reaching navigable waters of the United States. The SPCC requirements almost always apply to airport facilities due to the large quantities of fuel being stored. With the increasing numbers of aircraft making their home at Addison and a higher frequency of daily flights, airport officials determined that it was time to replace the ageing underground fuel storage facility. Their concept was to design and build a state-of-the-art refueling facility using the best available aboveground storage technology. The result is a sweeping wing-like canopy covering twenty-one aboveground steel storage tanks. The Washington Group was the lead engineering firm on the design of the new aboveground bulk fuel storage facility at the airport. The fuel storage facility's design required 330,000 gallons of aboveground storage capacity, which triggered compliance under the SPCC rules. The Washington Group decided to go with double-walled steel tanks. The Group's engineers specified nine 25,000-gallon, six 15,000-gallon, and five 300-gallon cylindrical tanks. The facility is designed to store Jet-A, Diesel, and AVGAS fuels for the many types of aircraft operating from Addison. The project specifications also included a 10,000-gallon high-performance oil/water separator. The oil/water separator was installed to remove any hydrocarbons that may contaminate the stormwater runoff from the tank-farm dike drainage system. The Thielsch Engineering Company was selected to complete procurement and installation of the project. The Washington Group engineers specified the use of thermally protected, double-walled aboveground tanks because they utilize the best available technology and are Underwriters Laboratories (UL)-2085 and UL-142 approved. The oil/water separator tank selected for the project to treat the tank farm dike drainage was also state-of-the-art. The separator system was installed to satisfy the airport's NPDES permit. It was designed for the treatment of contaminated stormwater runoff at 0 to 1,000 gallons per minute discharging with a qualified / certified effluent quality of 10 parts per million (ppm) of free oil and grease. The separator meets the new Underwriter's Laboratories Inc. SU2215 design, construction, and performance standards for engineered oil/water separators rated at 10-ppm oil and grease. Currently, code enforcement officials consider UL-SU2215 certification as being the pre-eminent national consensus standard for oil/water separator construction and performance. The design engineers and the installer have made every effort to ensure that the new bulk fuel storage facility at Addison Airport will offer no threat to the surrounding community. Well-maintained ASTs should ensure there will be no accidental releases of fuel being discharged in the facility's stormwater runoff. Ballistics Test: The tank must withstand five rounds of 150-grain M-2 ball ammunition without having the primary tank penetrated. Impact Test: The protected tank must withstand a blow by a 12,000-pound mass, traveling 10 miles per hour, without penetrating the primary tank. Two-hour Pool Fire Test: The internal temperature of the tank during the two-hour test cannot exceed 260 degrees Fahrenheit average temperature rise, or 400 degrees Fahrenheit maximum temperature at a single point in the tank. Hose Stream Test: The tank must withstand the impact, erosion, and cooling effects of a hose stream without penetrating the primary tank. The chosen tanks had previously passed a battery of tests required by Underwriters Laboratories (UL) to receive the UL 2085 listing for "Insulated Secondary Containment Aboveground Tank for Flammable and Combustible Liquids". The UL testing also included a two-hour fire test (see figure 2), interstitial communication test, and proof-of-emergency-venting capabilities. 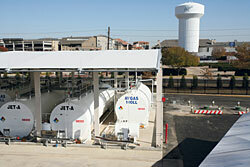 The tanks are now approved for motor fuels storage under every National fire code, including the Uniform Fire Code (UFC), NFPA 30, NFPA 30A, Southern Building Code Congress International (SBCCI), Standard Fire Prevention Code (SFPC), Steel Tank Institute F941 "Standard for Thermally Insulated Aboveground Storage Tanks," and 1993 Building Officials and Code Administrators (BOCA). Stephen R. Verbit, Esq., is an environmental attorney in private practice in Miami/Fort Lauderdale, Fla.